Some cookbooks lure you in with the cover. 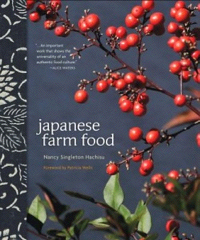 Take Nancy Singleton Hachisu‘s Japanese Farm Food (Andrews McMeel 2012) pretty cover designed by Julie Barnes and Diane Marsh. The spine is covered with blue cloth decorated by white floral designs. The photograph Kenji Miura of red crabapples clinging to a branch captures the seasons and underscores that this is about seasonal, fresh ingredients sourced on a Japanese farm and nearby. There is texture and that underscores the idea that inside the book there is more than meets the eye. The cooking is farm cooking, that Nancy describes as “uncomplicated and intuitive.” Her attitude towards life is much the same – it’s interesting to read about her home-schooled adventure with three sons, trips abroad, and food. There is a guide to ingredients, tools and knives, and cooking techniques – all from the point of view of a non-Japanese cuisine expert. Even those well versed in the cuisine will pick up some nuggets of insight. The first recipes are for Tsumami: Small Bites or little appetizers. Many are quite simple and very light. Start with Salmon Roe (p. 26) seasoned with sake, yuzu, and sea salt or Young Scallions and Miso (p. 29) that is freshly dug young scallions, cleaned and served with miso as a dipping sauce. Fried Eggplant Halves with Sweet Miso (p. 53) includes a marvelous sauce made of miso, mirin, sake, shiso leaves, and ginger. At the end of the chapter, is a wonderful bonus recipe for Apricot Cordial (p. 59) that can be made from most fruit. She mixes organic sugar, white liquor (or vodka) and fruit. The Russians do the same thing with their vodka – but they leave it in the sun, and Nancy leaves it in the dark for at least three months. Each of the following chapters has wonderful recipes for making tofu or udon noodles from scratch, or country sushi rolls. The fish chapter includes clams simmered in sake with scallions (p. 247) and cod tempura (p. 248). The recipes are easy, not intimidating, and worth trying only with the best ingredients. This is a book that focuses on lighter, less sweetened dishes – but there are plenty of meat and poultry dishes, too. Even without a Japanese farmstead of your own, it’s easy to incorporate the simple and flavorful recipes in a Western meal. Still, a holiday in the Japanese countryside is more and more appealing.